class="page-template page-template-page-sections page-template-page-sections-php page page-id-639 samba_theme wpb-js-composer js-comp-ver-4.1 vc_responsive"
What do Bournemouth people say about us? We are proud members of Checkatrade, an independent service that vets and monitors tradespeople to ensure they deliver a reputable service. We’re delighted to say that after over 100 reviews on the service, we still have a 100% satisfaction score! 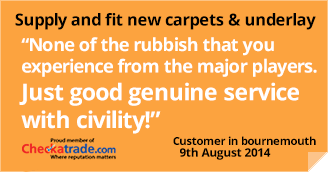 To see the rest of our reviews, visit our Checkatrade page.